Today I had to fix another STM32F4 Discovery board. By fixing I mean replacing the STLink firmware with Black Magic Probe firmware. I do that on a semi regular basis but as I have not done it in a long time I did not remember the process anymore. Obviously this calls for a blog post with some step by step instructions on how to do it, so that I have a reference in the future. Also you might find it useful yourself. First of all let’s explain what we are trying to do. The objective is to replace the STLink SWD (Serial Wire Debug) firmware with Black Magic Probe firmware. The board is setup by default to use a smaller chip to run the STLink firmware to talk to the main stm32. We need to change the smaller chips firmware. The initial adjustments to the board are needed to be able to access the programming pins of the smaller chip and replace it’s contents to Black Magic Probe firmware so that we can use GDB (GNU DeBugger) to program and debug the board instead of the very unstable and unreliable proprietary STLink protocol. 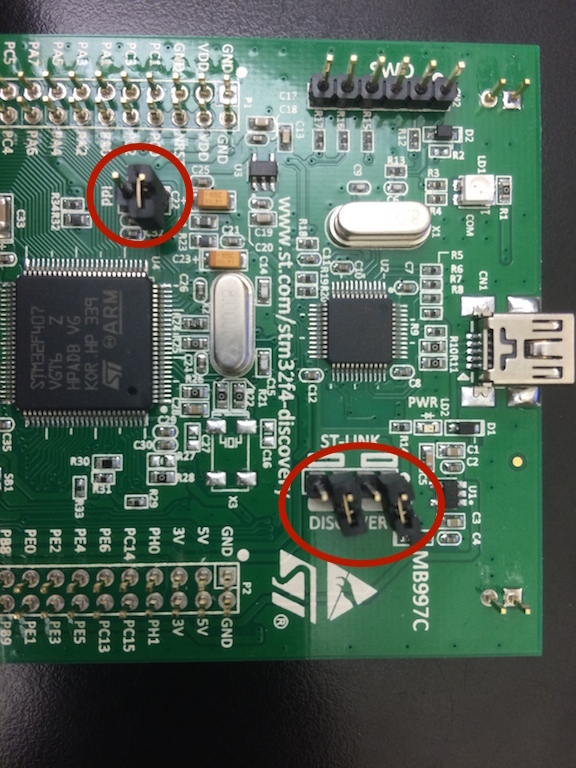 The adjustments needed to access the small chips programming pins need to be reversed once the firmware is changed to Black Magic Probe firmware, resulting with an stm32 f4 discovery board with Black Magic Probe firmware ready to use. For the “Fixing” process I use a genuine Black magic probe, I have one of those very early ones with a 0.1″ header that is very useful in this particular case. You can also use a Black Magic Probe Mini with a PCB adapter, make an adapter cable or you can use another Discovery board that has already been “fixed”. First step is to change the two solder jumpers on the bottom of the discovery board. Jumper modification for SWD programming. Remove the 0Ohm resistor/jumpers marked with red circles, and close the jumpers marked with blue circles. Note: The easiest way to do that is to use a soldering tip, add a bunch more solder over the resistor and swipe them of. After that is done use solder wick to make sure there is no short on the “red” jumper. You can discard the 0Ohm resistors. It is much easier to just add a small blob of solder to close the “blue” jumpers, it is easy to remove them later in the process by just using some solder wick. Remove the SWD and slave MCU jumpers as indicated by the red circles in the photo. Attach jumper wires to the Black Magic Probe header. Attach the Black Magic Probe to the discovery board. Now you can connect the discovery board and the Black Magic probe to your computer via USB. The order should not matter, but usually I tend to connect the usb wires to the laptop before connecting the SWD wires between the two devices, just to make sure we don’t have some strange current loop that powers one or the other via IO pins, which might be problematic. Now we turn our attention to the software. You can obviously do these steps before you wire everything up but this is the order I followed. In the case you are on Linux you can leave out the -d device parameter. For reference the -s parameter tells hexprog to use Serial Wire Debug instead of JTAG and -r tells it to unlock and erase the target chip. If you skip any of those two parameters it will not work for you. Flash the bootloader. We are getting very close. To upload the blackmagic bootloader you use arm-none-eabi-gdb. This sequence of commands attaches to the virtual gdb server that is provided by the Black Magic Probe on it’s virtual serial port 1. (The second serial port is the USB to serial interface located on the back of the BMPM) We then tell the monitor (this is the BMP) to scan using Serial Wire Debug as our protocol. Next we attach to the virtual process number 1. (As we are on the embedded systems there usually should only ever be 1 process unless you run an RTOS) We load the firmware from the elf file that we passed on to gdb earlier and exit GDB. Note: On Linux the cu.usbmodem device name will be /dev/ttyACM0 instead. Disconnect your Black Magic Probe and Discovery board from your computer as well as each other. 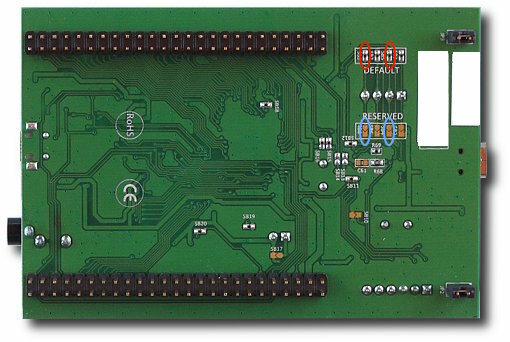 Remove the solder blobs you have added on the back of the board. Add solder blobs to where you removed the resistors at the very beginning. Put the jumpers back to where they were on the front of the Discovery board. You are pretty much done now. If everything went well you should have your “fixed” discovery board. Follow to the one additional step below to test that. Additionally if everything went well if you are on Mac OS X a /dev/cu.usbmodemSOMESERIAL1 and /dev/cu.usbmodemSOMESERIAL3 should appear. If you are on linux you should be able to find ttyACM0 and ttyACM1 in the /dev directory. 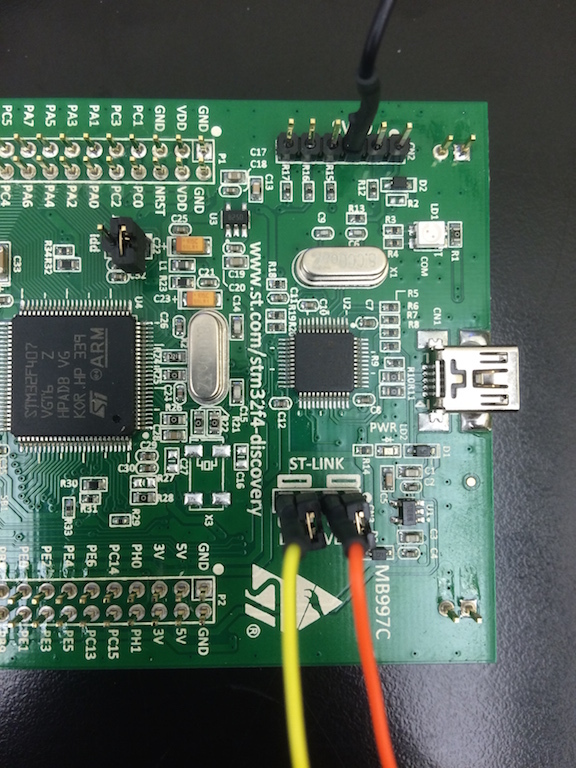 This entry was posted in Computerworld, Embedded, libopenstm32, Projects and tagged debugger, Embedded, jtag, libopencm3, programming, stm32, SWD on December 29, 2014 by esden. A few months ago I met a great guy Gareth MacMullin in the libopencm3 channel. 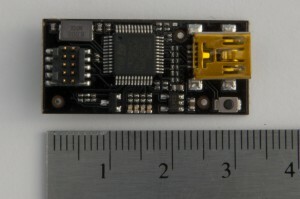 He was working on a new Open-Source and Open-Hardware JTAG solution called Black Magic Probe(BMP). I got one of those and instantly fell in love with it. OpenOCD is great in a sense because it supports lots of targets and probes but that is its disadvantage too. It is very often difficult to set up and tends not to work properly in many cases. The approach of BMP is quite different. Instead of the probe being quite dumb and using OpenOCD to do the JTAG magic the BMP uses a microcontroller (STM32F1) and implements a GDB server inside the controller. 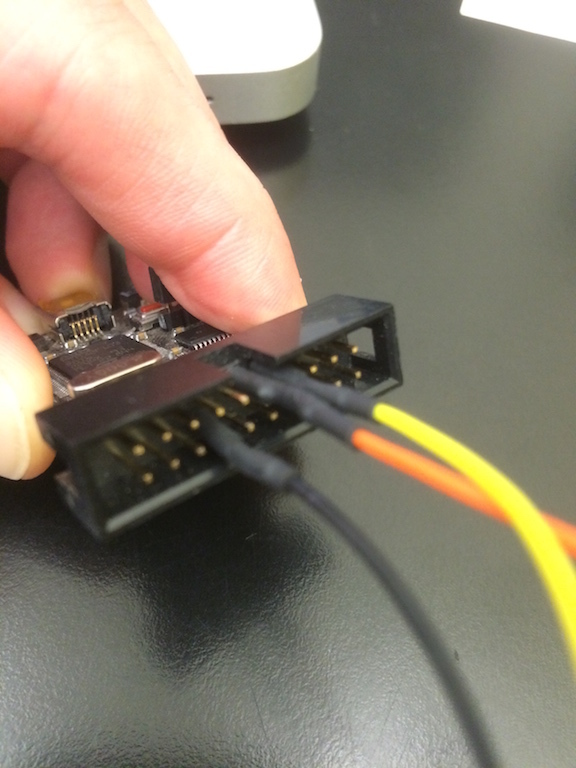 This solution cuts out the middleman and talks JTAG as well as the new Serial Wire Debug (SWD) protocol itself. Requiring only a working GDB on the computer. It shocked me how fast the loading process was. Because it is not one of the FTDI chips and does not have to bitbang all of the JTAG protocol over USB it can run much much faster. I know there are commercial devices like JLink that have logic inside them but they cost arm and a leg if you don’t want to just get the educational version of it. One more thing comes to mind when you realize that the BMP supports SWD. You only need three pins to be able to use it GND, SWDIO and SWCLK. That decreases the required real estate on the PCB significantly. I am not sure what the status of OpenOCD support for SWD is now but it is work in progress as far as I understand. On BMP it just works. Since I started using the BMP there were several interesting developments that Gareth added. The BMP is not only offering one serial port for the GDB extended remote interface but also a second one providing a TTL level UART interface. The BMP also supports tracing by now using the TRACESWO pin. This provides a reasonably high speed tracing. Gareth also wrote a plotter for this feature that plots the contents of traced variables in your code. 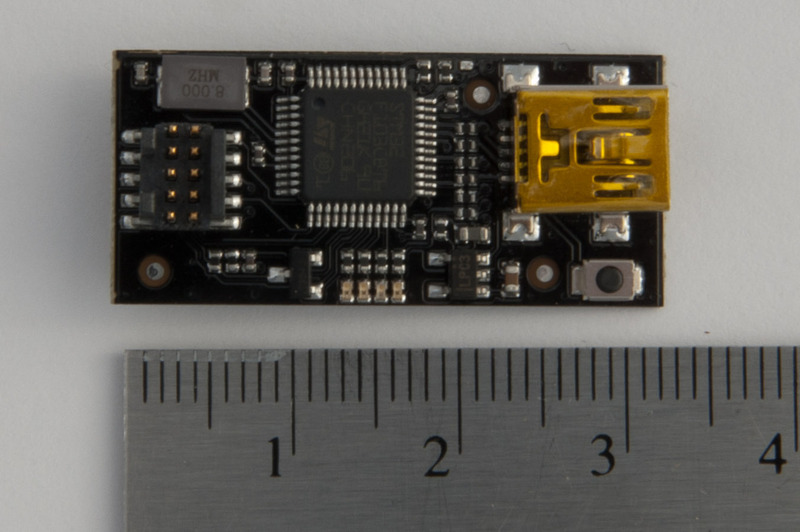 Early versions of BMP were 2.5cm X 5cm the current version called Black Magic Probe Mini (BMPM) is smaller, the same size as the FLOSS-JTAG I made a while ago, it is mere 1.5cm X 3cm, packing in all the power of the BMP what makes it great for doing embedded stuff on the go, for example in the subway. So to wrap things up, it is a high grade, Open-Source and Open-Hardware device. For $60 this thing is a steal! Shameless plug: On 1 BIT SQUARED store you can order the Black Magic Probe. This entry was posted in Computerworld, Embedded and tagged black magic, black magic probe, BMP, BMPM, debugger, debugging, Embedded, flashing, GDB, interface, jtag, micro controller, openocd, probe, programming, serial, stm32, SWD on July 13, 2012 by esden.